The fight may have been over – but Josh Norman still had a lot of fight left in him. 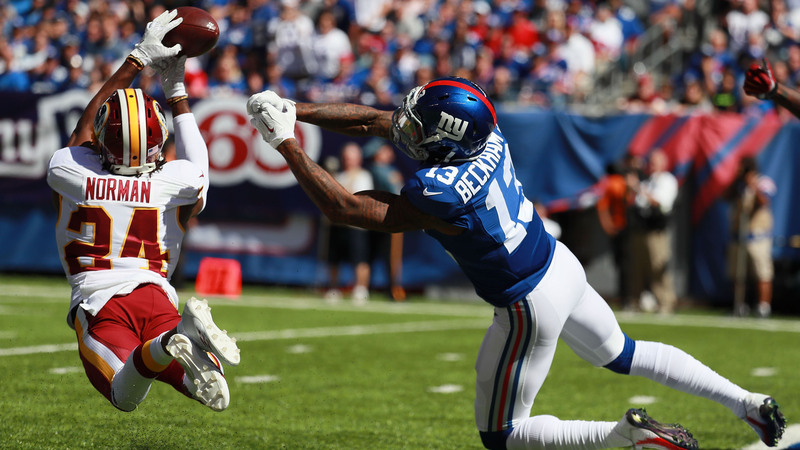 As the Washington Redskins milled around the field after their potentially season-saving 29-27 victory Sunday over the New York Giants, the team’s superstar cornerback displayed energy more indicative of a player hyped for a game to start. Norman battled his archenemy for four quarters in the NFL’s most anticipated one-on-one matchup of the first few weeks of the season, but there he was, darting everywhere, flashing his signature smile while commending the Redskins for their perseverance. Self-congratulations were in order, too. After his previous ugly encounter with Giants megastar wide receiver Odell Beckham Jr., Norman deserved a chorus of “atta-boys” for keeping his head in the game at East Rutherford, New Jersey. All afternoon, Norman maintained his cool in his face-off with Beckham. Although Beckham got his in a seven-catch, 121-yard performance – among wideouts right now, Beckham’s name is very high on a very short list – Norman showed why he got paid. Beckham didn’t beat the Redskins on deep balls (his longest gain was a 26-yard-catch-and-run play). More importantly for Washington, he stayed out of the end zone. Norman’s smart effort against Beckham was among the keys to the Redskins’ first victory. They overcame an early 14-3 deficit and the loss of four starters, who each suffered game-ending injuries. Well, finally. After the first two games, the Redskins seemed to be speeding toward an iceberg. At least in Week 3, they steered clear of it – for now. Without Norman’s contribution, their captain acknowledged, they may have sunk. Everyone in the room understood exactly what Gruden meant. EAST RUTHERFORD, NJ – SEPTEMBER 25: Josh Norman #24 of the Washington Redskins breaks up a pass to Odell Beckham #13 of the New York Giants at MetLife Stadium on September 25, 2016 in East Rutherford, New Jersey. In Week 15 last season, Norman-Beckham I (Norman was playing for the Carolina Panthers then) produced five combined penalties – three times, Beckham was tagged for unnecessary roughness, and he was later suspended for one game – and a lingering beef began between the young stars. Then they raised the stakes in dueling magazine articles during the offseason, Beckham telling GQ in its August issue that the reason Norman became “so relevant is because of me.” Predictably, Norman fired back in an ESPN the Magazine cover story, saying, among other things, that Beckham “lost so much respect from people for that little tantrum” he had on the sideline during the Panthers’ 38-35 victory. The Redskins lured Norman from the Panthers by making him the league’s highest-paid player at his position. On teams in the same division, the loquacious, intense antagonists could face each other at least twice every season. Talk about get-the-popcorn-ready entertainment. Staring at the possibility of an 0-3 start and the Giants leading the division with the opposite record, the Redskins needed Norman to chill at MetLife Stadium. Dude was ice-cold. At times, Norman has had to overcome opponents and Washington defensive coordinator Joe Barry, whose first two game plans, to put it nicely, were less than impressive. Barry relied way too heavily on Bashaud Breeland, Washington’s No. 2 corner, against top-line wideouts Antonio Brown of Pittsburgh and Dez Bryant of Dallas in the first two games. On Sunday, Breeland suffered an ankle injury in the first quarter and sat out the rest of the game. Basically, it was all Norman-Beckham all day. Fine with Norman. Beckham got even more of an earful. Well, it’s not as if Beckham is under the microscope without cause. Again Sunday, he became emotional on the sideline. Presumably upset about several of his teammates’ blockheaded plays (the Giants should just burn the game film), Beckham punched the net that place kickers use to practice. It bounced back and hit him on the head. In the closing seconds, tears appeared to well up in his eyes. “I don’t remember” crying, Beckham said. No matter how Beckham rolled, though, Norman was all about one thing: helping his fam get their first victory. Goal accomplished. And on a day that he never raised his fists, Norman couldn’t have fought better.